Nepali fabrics aren’t just a cultural representation of our diverse ethnicity but they are also reliable and durable than most fabrics in general. In the last decade or so, Nepali producers have largely ignored these wonderful materials but in the recent years various new companies have shown a renewed interest in them. One of these companies is Dochaa Nepal. Watsal Rajbhandari, Dikesh Prajapati, and Amuda Mishra met while volunteering in the post earthquake activities in 2015. They shared the nation’s dismay at the loss of such invaluable heritages and held long discussions at cafes about the possible repercussions of the calamity from a cultural point of view. One thing they were sure of – they wanted to contribute to the preservation of Nepal’s essence in culture and heritage. What got their conviction take a turn into the footwear industry was their shared love for shoes. “We are shoe fanatics, if that’s even a thing. 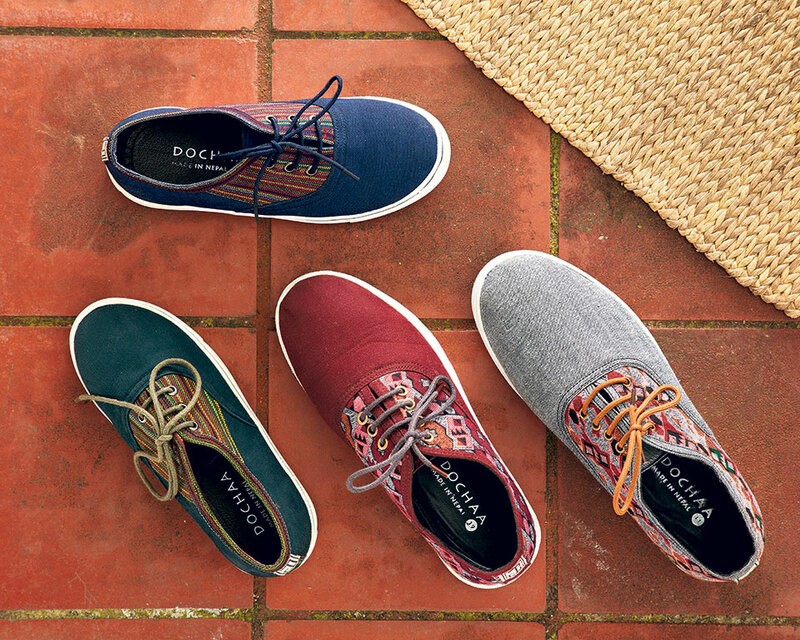 So you could say that were all well versed with the requisites for a good pair of shoes,” says Prajapati who oversees the design and promotional aspects of Dochaa. The trio came from non-business backgrounds: Prajapati is an IT graduate while co-founders Rajbhandari is an engineer by profession and Mishra runs her own social organization. However, despite being unsure of the logistics and the legalities behind running a business, the three agreed to give it a try. They began with searching for the right vendors for their fabrics. Once they had secured a reliable vendor they searched for skilled workers who could bring their designs to life. It was so that during this time they arranged for themselves a factory space for future productions at Maharajganj, Kathmandu. Prajapati was responsible for the designs and he paid special attention to it to make sure that the fabrics are the highlight of their shoes. However, durability and comfort are also taken into account. They decided on the name “Dochaa” by deriving the word from the Sherpa attire (bakkhu docha). “Because the aim has always been to promote and preserve the cultural attributes of Nepal we thought it befitting to our objectives. And we named our company Dochaa,” says Prajapati. In late April 2017, Dochaa opened for limited orders and the shoes sold out before long. The shoes make use of jeans, dhaka, syama and lawa. Under the Dochaa Classics, currently, they have buna dochaa (made of dhaka), mang dochaa (made of syama fabric traditionally worn by the Tamang community), and nakha dochaa (made of the Newari hand-woven lawa fabric). The feedback, the founders say, has been phenomenal. “We have people writing to us everyday expressing their appreciation for the work we are doing. We have built a strong customer base, albeit a little small, in the last 18 months. Some of our customers have been with us from day one and we are gaining a noticeable presence through word of mouth,” explains Prajapati. The Dochaa team believes that they have been successful in earning customer loyalty because of their commitment to quality and also because of the fact that they take all the criticisms that come their way in their stride – not letting it affect them but making sure they look into it and work on their weaknesses too. During the first month of sales they personally thanked each of their buyers and took their feedback. They began importing the shoe soles after receiving complaints about the poor quality of soles. “Our purpose has always been to make use of Nepali produced materials but, despite our several attempts, we couldn’t find soles in our market that could meet our quality expectations. Some things, we have learnt, aren’t in our control so we have to make do with the limited alternatives that we have,” says Prajapati. Dochaa Nepal’s growth so far has been an organic process – of receiving positive feedbacks that act as a push to improve their products. By late February 2019 they plan to release a whole range of designs. This time, however, they are handing over the creative tasks to the unrepresented Nepali artists. In what would be bannered under Dochaa’s Artistic Edition, the shoes will be a way to showcase the works of Nepali artists. “This is our way of storytelling, through shoes,” claims Prajapati. Dochaa is also determined to challenge the preconceived notions of Nepal-made products being of poor quality. Prajapati says that when you pay attention to details you can easily deliver good quality products. Lack of resources isn’t a problem though it can be a stumbling block sometimes. For the three owners, Dochaa is their contribution in preserving all that we are losing with time. They wish to hold workshops to train the youths in production processes so that they not only earn their own keep but also possess the necessary skills to sustain them throughout life. So far, Dochaa has been successful in giving women groups a chance at a stable income. For the packaging, they use handmade paper bags made by women groups in the comforts of their own homes. Being able to provide them an opportunity meets one of their purposes of community empowerment. And by accommodating the various preferences of people, providing artisans a platform for storytelling, and empowering groups of people, Dochaa Nepal is only looking forward.